The seven sleep stealers that might be keeping your child awake. 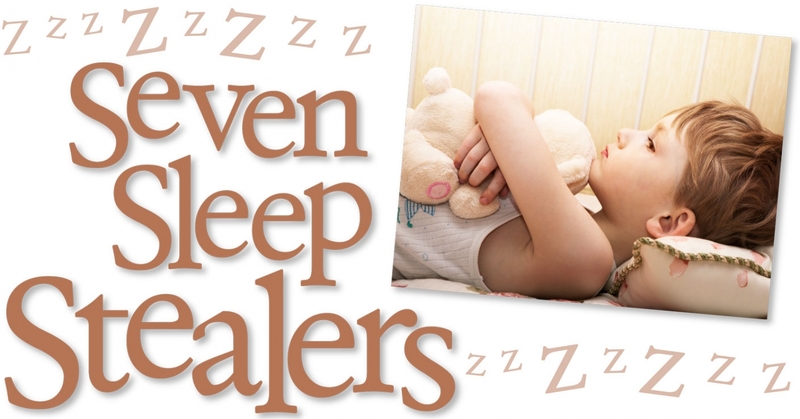 There are seven main “sleep stealers,” or reasons children don’t sleep well. Your child may be affected by one of them, by a combination of several or— if you’ve hit the jackpot— by all seven. Ensure physical activity ends before the routine. Put aside about 15 to 60 minutes at nighttime and about 15 minutes before a nap to complete the routine. Do the routine in the room where your child sleeps. Do about the same pre-slumber activities, each time in the same order. It’s natural to rock or feed your child to sleep, but doing this doesn’t help him stay asleep all night— many children who fall asleep this way awaken repeatedly. Such disruptions are often caused at least partially by children’s dependence on “sleep associations.” Sleep associations are conditions that your child associates with falling asleep, including being held, being rocked, sucking or falling asleep with a parent. Throughout the night, your child drifts into lighter sleep phases to check out his environment. During these “partial arousals,” he’s not fully conscious. And as long as nothing has changed significantly since he fell asleep, he returns to deeper sleep. But for many children, if something is different, this raises a red flag and your child will need you to recreate the same conditions that were present when he fell asleep in the first place. While not all associations are bad, what’s important is that your child can recreate them on his own and put himself back to sleep. Your child’s environment plays an important role in his ability to sleep well. He needs to be protected from disruptions that can prevent him from settling to sleep, sleeping deeply and sleeping for the right length of time. Your child’s crib or bed should be all about sleep, and whatever doesn’t contribute to sleep should go. On a scale of one to ten— ten being dark— your child’s room should be an eight or nine. Protect your child from distracting sounds with white noise. You can use a fan, air purifier or white noise machine. Dress children in pajamas warm enough to protect them without a blanket. Sleep aids include pacifiers, swaddling cloths, blankies and music. Although some sleep aids lead to sleep associations, not all are detrimental. Determine when certain aids are appropriate and when they interfere with sleep. Allowing your child to stay up until he seems tired nearly guarantees a bumpy night of sleep. Your child will probably wake early, due to morning light; or your child will likely become overtired. For children of every age, there are optimal “sleep windows” in which it is easiest to drift off into sleep. If your child goes too far past this window, his body becomes stressed and produces the hormone cortisol. Cortisol acts as a stimulant, like caffeine, and can cause your child to act wired or to appear to get a second wind. Most children do well with a bedtime between 7 and 8pm; 8:30pm is the latest bedtime we recommend up to age 10. Choosing a consistent bedtime doesn’t mean that your child won’t ever be able to stay up late for a special occasion or a family night out. If he does stay up late one night, however, try to put him down on time the next. Most children need at least 11 hours of sleep to function well. And bedtime means your child is in his crib or bed with the lights out. Your child may not want to go to sleep because he doesn’t want to miss the action, and your older child wants more control than he did as a baby. Put the two scenarios together, and you have a child who will do everything he can to stall bedtime. We hear stories from parents about their children’s award-winning performances as they try to delay bedtime. Pulling out all the stops, some children act as though they’re in the Sahara dying for water or insist that they’ll waste away in the middle of the night unless they have a bedtime snack. If your child isn’t highly verbal yet, he may simply tantrum when you try to put him to sleep. Either way, the drama can be intense and almost always gets a reaction from parents. It can be tempting to give in to the demands of your adorable toddler, but delaying bedtime isn’t good for either of you. To be successful in learning how to sleep, your child needs to have one clear, consistent response to his night wakings. If you sometimes feed him when he cries and sometimes do not, he’ll become confused and cry longer and harder overall. You may be wondering how your baby will make it all the way through the night without feeding. You have every reason to be concerned about this if your child is used to eating at night. But by the time a baby is 5 months old and weighs 15 pounds, he should be able to sleep all night without a feed. If you have a toddler who is growing well, he is perfectly capable of taking in all of the necessary calories and hydration during the day. Jennifer Waldburger, LCSW, and Jill Spivack, LMSW, are psychotherapists and co-founders of Los Angeles-based Sleepy Planet, where they offer private sleep consultations and parent education. Gain a better understanding about children’s sleep needs in their book The Sleepeasy Solution; The Exhausted Parent’s Guide to Getting Your Child to Sleep from Birth through Age 5 (HCI Books).